RONKONKOMA, NY — October 16, 2015 – Sigma Corporation of America, a leading DSLR lens and camera manufacturer, is setting new benchmarks for wide-angle image quality with the announcement of the newest Global Vision and market’s first full-frame 20mm F1.4 lens, the Sigma 20mm F1.4 DG HSM Art lens. The lens will be on display at PhotoPlus International Conference + Expo in New York City from October 22-24. The lens will become available late November for the street price of $899. This revolutionary prime lens is designed to bring out the full potential of ultra-high-megapixel DSLR cameras. With a focal length of 20mm and F1.4 aperture, this lens delivers outstanding large-aperture brightness and bokeh. Through decades of experience in lens design and Sigma Global Vision lens craftsmanship, the 20mm incorporates both “F” Low Dispersion (FLD) glass, and five Special Low Dispersion (SLD) glass in a design of 15 elements in 11 groups. The combination of advanced optics and optimized lens power distribution minimizes spherical aberration, axial chromatic aberration and field curvature, producing outstanding image quality. The wide angle and outstanding image quality make this lens great for seascape, cityscape, and astrophotography, as well as for photos in low light, indoor photography, portraits, and event and wedding photography. From the start of the design process, Sigma took steps to minimize flare and ghosting, and established an optical design that is resistant to strong incidental light sources such as backlight with its Super Multi-Layer Coating. 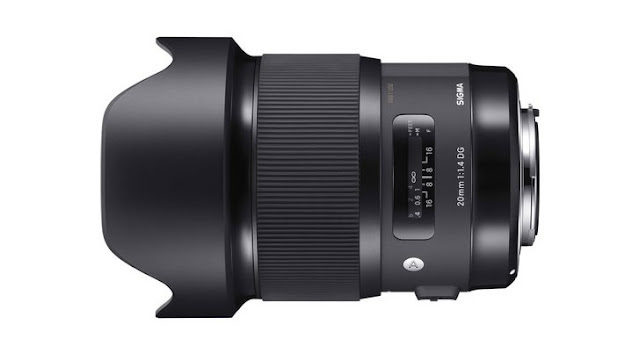 As with all Sigma Global Vision lenses, the 20mm F1.4 lens incorporates the latest Sigma technology, including an optimized autofocus (AF) algorithm for smooth, fast, and accurate focusing. In addition, Thermally Stable Composite (TSC) compound material is used, which has a high affinity to metal parts, consistently performs well at extreme temperatures, and reduces the size and weight of the lens. This lens is compatible with Sigma’s USB Dock, (sold separately) which allows photographers to update the lens’ firmware, adjust focus points and customize full-time manual focus over-ride function settings using Sigma’s Optimization Pro software. A new metal lens cap (LC907-02) is also available as a separate accessory for $23. Sigma fans can feel confident knowing that every 20mm lens that leaves Japan’s factory has been tested using Sigma’s own modulation transfer function (MTF) measuring system, “A1.” Other prime lenses in the Art line include : 24mm f/1.4 DG HSM, 30mm f/1.4 DC HSM, 35mm f/1.4 DG HSM, and 50mm f/1.4 DG HSM.